Everyone learns differently. You’re either a visual, audio or tactile learner, right? WRONG! For years students have been taught about learning styles to help them better tailor their studying to their strengths. But guess what? “Learning styles” don’t actually exist! So what is the best way to learn? 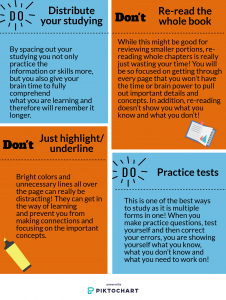 Check out some studying Do’s and Don’ts to help your college studying habits improve no matter how you think you learn best! By using study strategies that will actually help you retain the information you’ve spent hours learning, you can improve your studying habits/ grades and use your time more efficiently!